Tribùs build took the environment into account. The hull was hand-painted, not sprayed, using TBT-free bottom paint. The Ships Recycling Convention , which deals with the recyclability of ships and recycling facilities ashore (that is also not yet in force).In addition to these international rules, some nations have adopted extra requirements for navigation in their local waters. For example, the Baltic and North Sea are Sulphur Emission Control Areas; Alaska has stricter requirements on sewage, grey water and oil pollution; California has its own legislation on diesel engines’ emissions; and many areas in the Mediterranean can only be accessed by certain ships and require potential polluting substances to be retained on board. The first international instrument to protect the marine environment from ships’ pollution was the MARPOL Convention – in full, the International Convention for the Prevention of Pollution from Ships – which came into force in 1983. For the purpose of MARPOL, ‘ships’ are vessels of any type operating in the marine environment, including yachts. The MARPOL Convention is comprised of six annexes covering marine and air pollution. Four of these annexes are applicable to yachts in private and commercial service. This annex deals with oil pollution from machinery, and mainly regulates the minimum production of oil residues and oily water, the separation of oil from water, and discharge of oil at sea. It is applicable to all yachts. Yachts having a gross tonnage equal to, or over 400GT, and engaged in international voyages need to be provided with an International Oil Pollution Prevention Certificate, valid for five years and subject to annual, intermediate and renewal surveys. This deals with sewage. 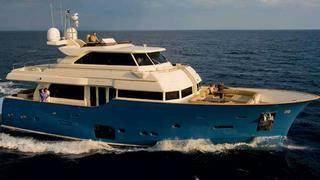 It is applicable to yachts with a gross tonnage equal to or over 400GT or carrying more than 15 people. It came into force in 2003 with the latest revision in 2005. Yachts were obliged to comply by September 2008. However, many yachts still do not have this certification. The certificate is valid for five years and subject to renewal. In order to meet the provisions of the annex, owners can either send sewage ashore or discharge it overboard, when more than 12 miles offshore, or equip the yacht with an approved sewage treatment plant capable of discharging treated sewage with certified effluent standards. If an approved treatment system is provided, then the treated sewage can be discharged at any distance from the nearest land, provided that the yacht is proceeding at a speed of over four knots and that no additional national requirements are applicable in the area. This entered into law in 1988 and deals with garbage and determines which wastes can be discharged at sea, and the distance from land it needs to be. No international certificates are required but yachts having a gross tonnage equal to or over 400GT, or are certified to carry 15 or more people, need to carry a garbage management plan with written procedures for collecting, storing, processing and disposing of garbage. They also need a record book where discharge at sea, discharge to reception facilities, incineration and accidental discharge is recorded. Ozone-depleting substances : Restriction of the use of halon in fire-fighting systems and some pollutant gases in refrigerating systems. Nitrogen oxides (NOx) : The production of these substances is mainly related to the engines. All diesel engines (except those for emergency use and installed on lifeboats) with an output of more than 130kW, installed on ships built after 1 January 2000, are certified in accordance with the NOx Emission Technical Code and provided with the relevant certification and technical files. Sulphur dioxide (SO2) : The emission of this substance is directly related to the quality of the fuel burnt and the quantity of sulphur content: it should not exceed 4.5%. In particularly sensitive areas such as Baltic and North Sea areas, called Sulphur Emission Control Areas, only fuels having a maximum sulphur content of 1.5% can be used. Volatile organic compounds : These are mainly produced by paint application. Incinerator exhausts : All yachts having a gross tonnage equal to or over 400GT must hold an International Air Pollution Certificate, which is valid for five years and subject to periodical renewal surveys.